McGrath, 2008; Seligman & Csikszentmihalyi), 2000; Waters, 2011). Strengths based approaches emphasise and build on the capabilities and resources of children and young people (Alvord & Grados). The aim of positive psychology is to see people in terms of their strengths and capacities, and to focus on what it is that helps people to thrive (Seligman & Csikszentmihalyi, 2000). 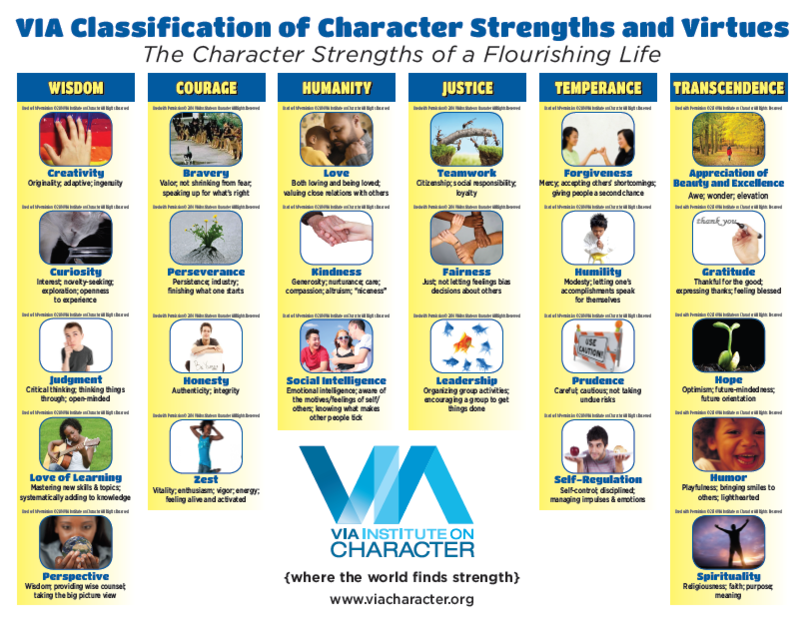 All parents are encouraged to take the VIA (Values in Action) Character Strength Survey and to establish a plan to ensure that you’re making time each week to develop and cultivate your strengths. In reflecting back to a previous newsletter and the description of Martin Seligman’s PERMA model, it is important to note that the regular and systematic actioning of our character strengths will bring an increased sense of Meaning and Accomplishment within our professional and personal lives.